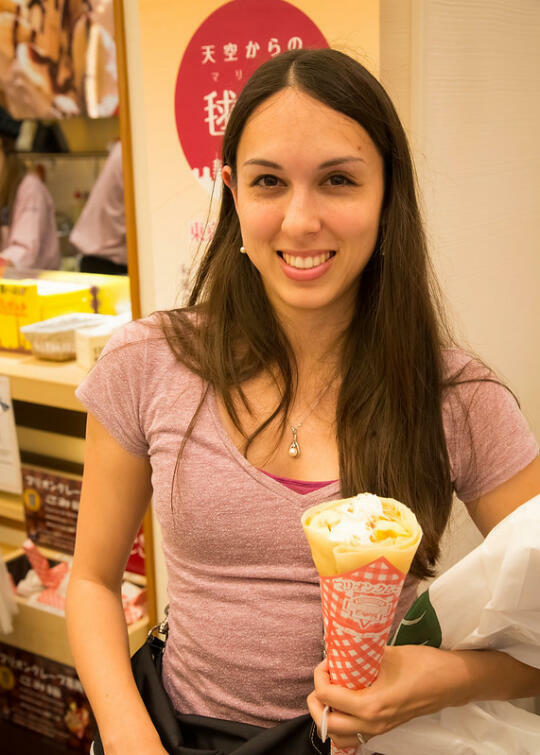 A big part of why we went to Japan this summer was to be there the same time Rachael was there. 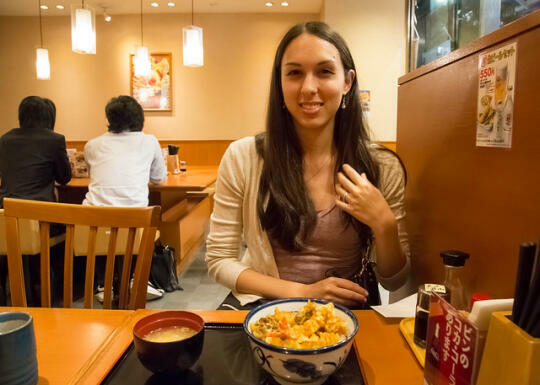 Since she’s lived there before, speaks and reads Japanese fluently, and – oh, yeah – we have a podcast about Japanese food that we do together, we decided that we should definitely, absolutely take a trip to Japan together. She goes to Japan every summer because her husband’s company sends him to Tokyo every year, so Son and I planned our trip to coincide with theirs. 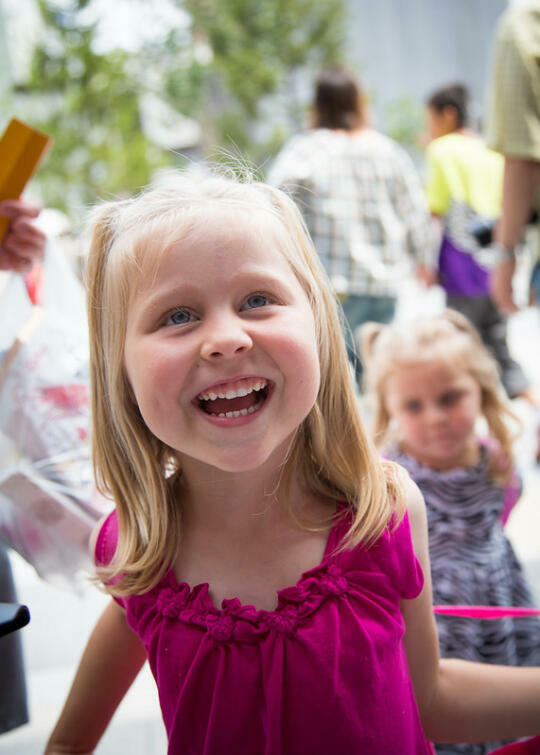 Since they found out not long before we left that they’d be able to take their two girls along this year, their flight scheduling meant they arrived a couple of days after we did. So what did we do the first day we were all in Japan together? 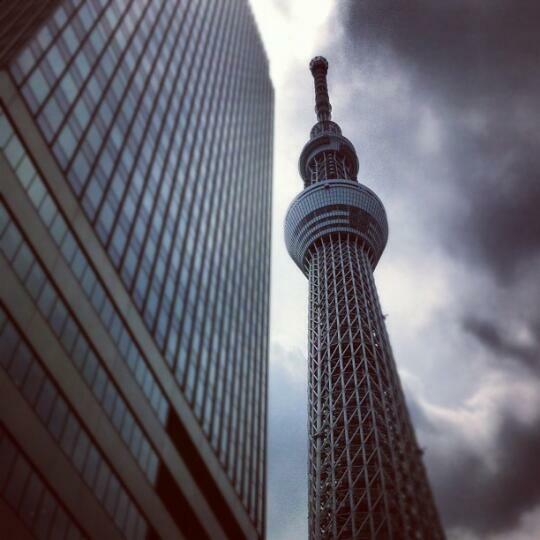 Well we visited the brand new Tokyo Skytree, of course! At 430 yen (about $5.50) for a grandé, it’s definitely more expensive in Japan. But holy cow, their soymilk is lightyears better than the soymilk you get in the US! Almost worth the ridiculous price. 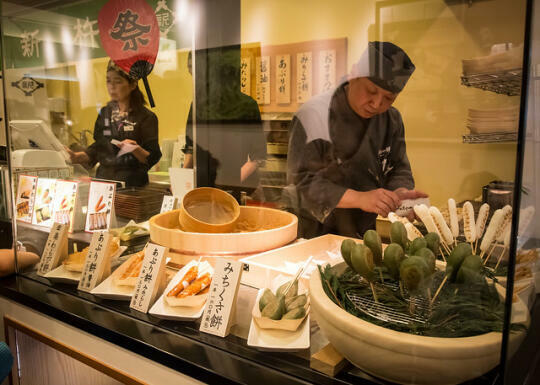 Once we found the Fujis, we all stopped by our newfound favorite onigiri place to pick up some onigiri (we got a salmon with mayo onigiri, and a laver paste – aka seaweed paste – onigiri) to take with us, then it was off to the Skytree! We were all hungry by the time we got there, so we found a curb to sit on while we snacked on the onigiri we bought. 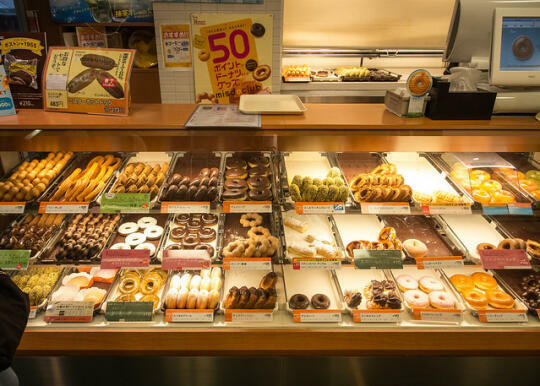 He insisted upon giving the girls a couple of boxes of cookies he had just bought to the girls, and talking to Rachael and Mr. Fuji for a while. 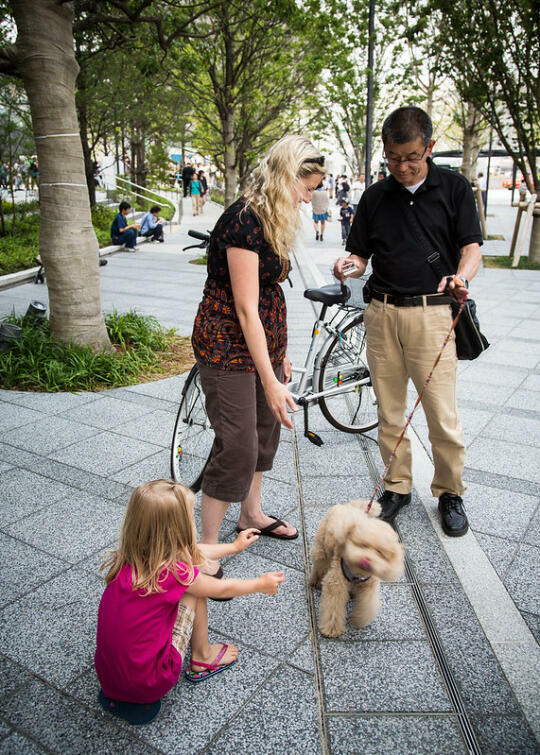 Then a man on a bike passed by with his dog, and they stopped to let the girls play with the dog. Both Rachael and I got dragged over there by her girls, so we could play with the dog too! Because really, who can resist an adorable dancing dog like this one? 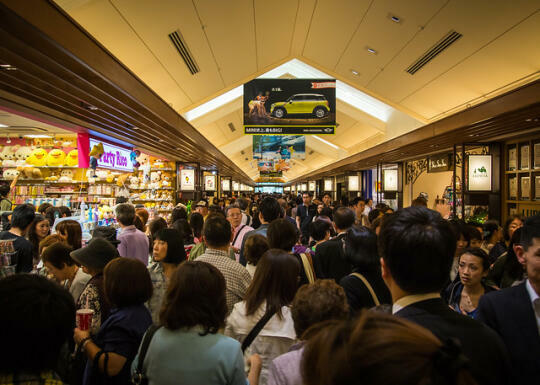 Have I mentioned yet that people in Japan really seem to like lining up for things? Such was the case with this statue – apparently if you stand in the middle of it, you can look up and it’ll line up with the Skytree. There was a ginormous line of people waiting to take pictures of the Skytree through the statue. We found this place called the Tokyo Curry Lab. 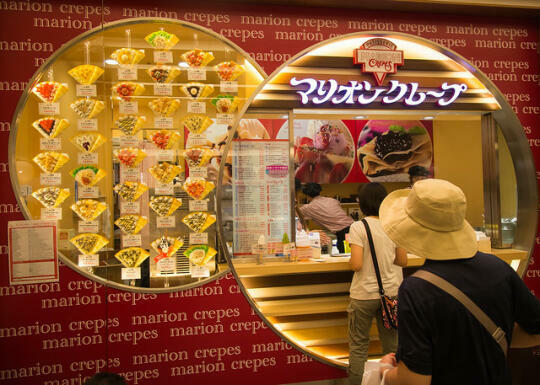 Both Rachael and I have a difficult time resisting curry-filled pastries, so of course we had to check it out. 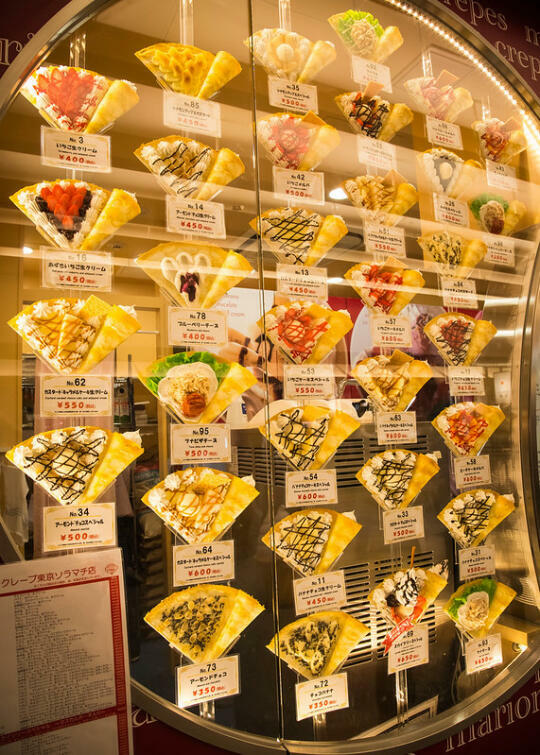 They sell these curry pies – 300 yen each. Rachael and I each got one. Delicious! Though I’d still have to say curry buns are my favorite. Pretty soon Rachael and her family had to be on their way (they had something else scheduled for the rest of the day), so we all said our goodbyes, for now. After they left, Son and I wandered the area a bit more. 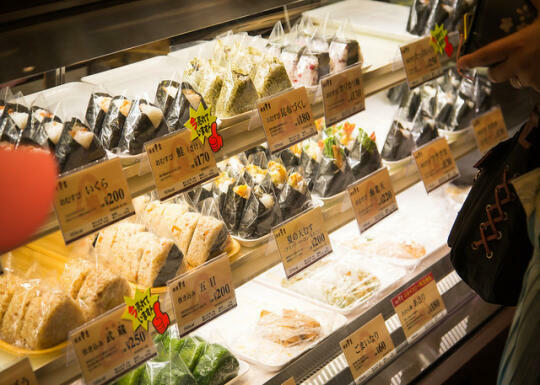 I’ve spoken of our newfound obsession with onigiri, which has resulted in us having a very difficult time resisting any onigiri specialty shops we come across. 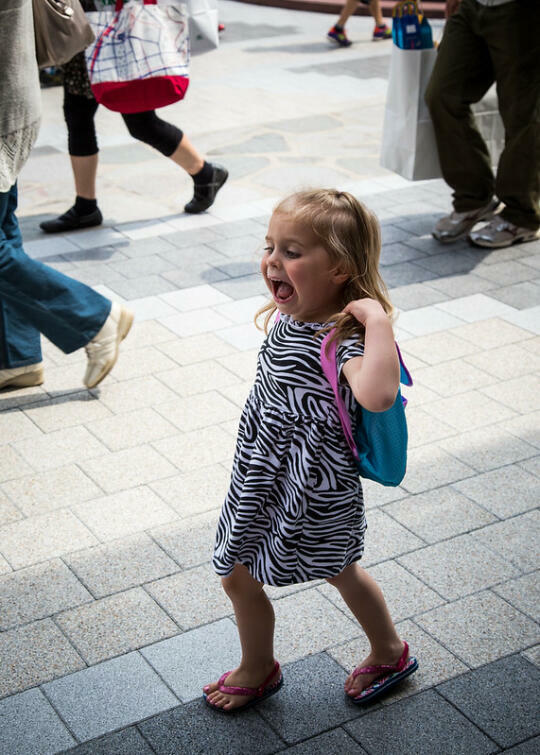 Especially when there are so many different, interesting types to choose from! Since we… er… still can’t read Japanese, we just picked two that looked interesting. I just adore how the Japanese wrap things up for you, although it does result in a whole lot of packaging that just ends up being thrown away. 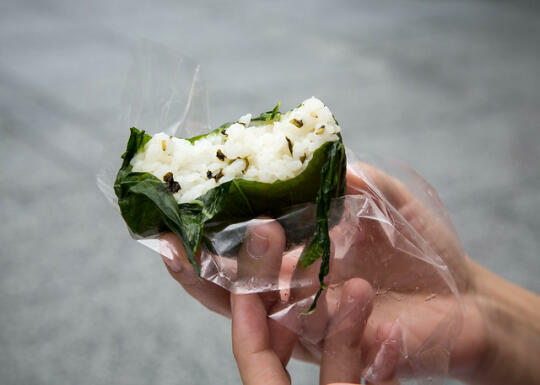 So we ended up with an onigiri that was wrapped in something akin to mustard leaves (though I’m not entirely sure that’s what it was). It use a mixed rice, but didn’t have any sort of fillings. The other one had tempura shrimp and lettuce in it. Delicious! Both for only 400 yen. 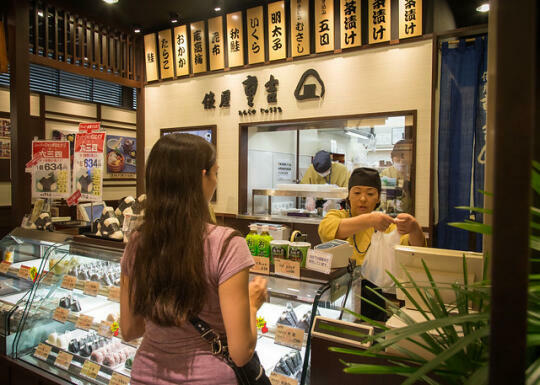 After we ate the onigiri, we headed back in, to a mochi shop we had passed. We decided to get two of the mochi skewers (dango?) that they were selling. 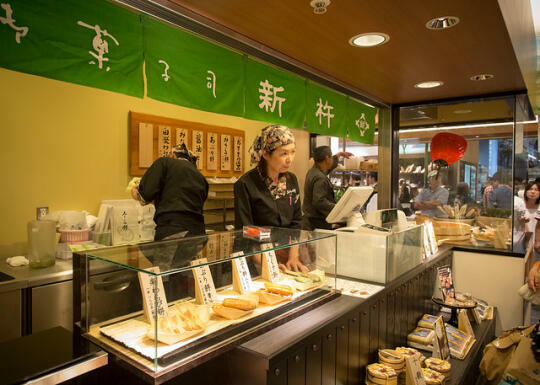 The first was warabimochi, an almost jelly-like confection covered in kinako (soybean flour). 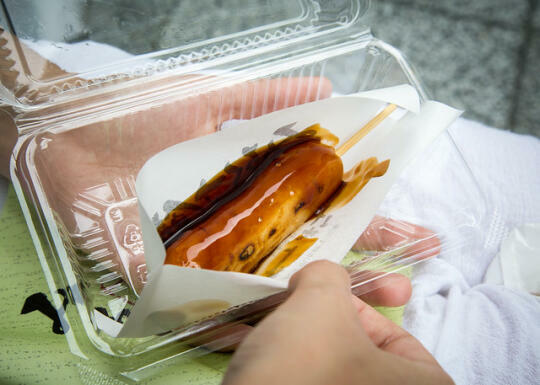 The second kind that we got was a sort of yaki dango (grilled mochi) with a sweet shoyu sauce. Both were delicious, and came out to a total of 310 yen. After pig-out part one, we walked around a bit, going upstairs where there was a Ghibli store. 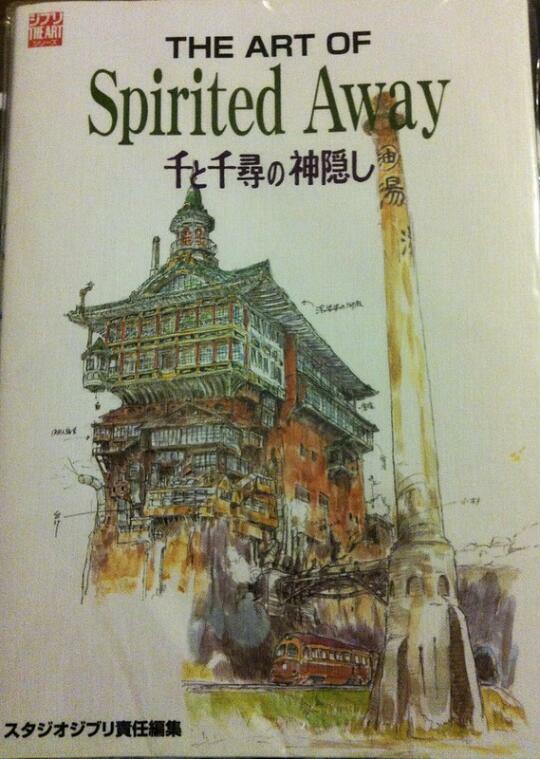 Son bought “The Art of Spirited Away”, because he’s been interested in doing a bit of drawing lately. 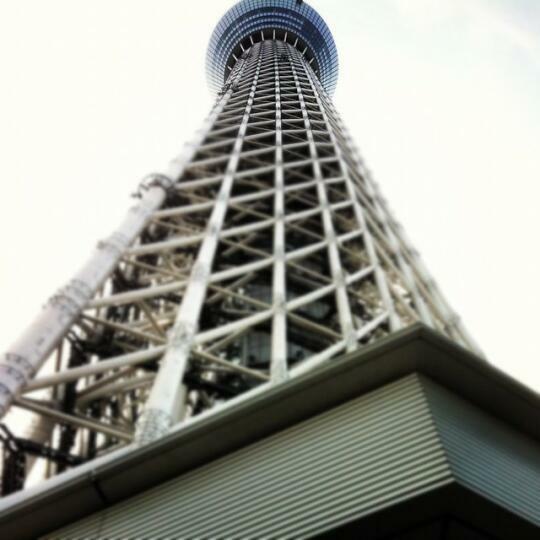 After that, we wandered around the upper level of Skytree Town, over to where the base of the Skytree is. We considered going to the Sumida Aquarium, which is right next to the Skytree, but decided there were better ways to spend our time there. 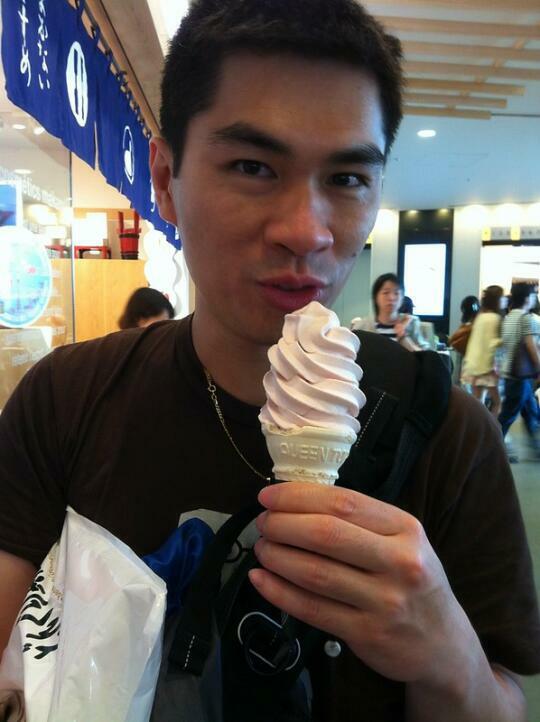 Such a strawberry milk soft cream, for example. There was a nice breeze, so we sat out on the plaza at the base of the Skytree to eat our soft cream (Japanese soft cream is like a mix between ice cream and soft serve). 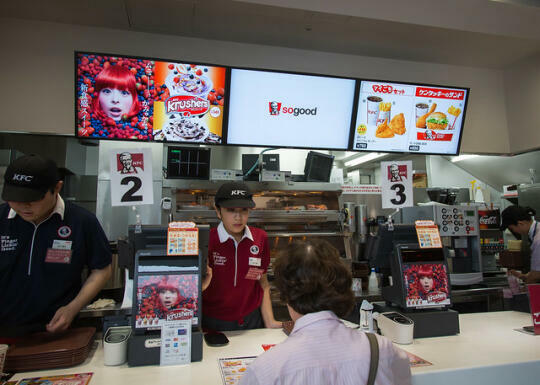 Then it was back downstairs, where we just had to check out KFC. 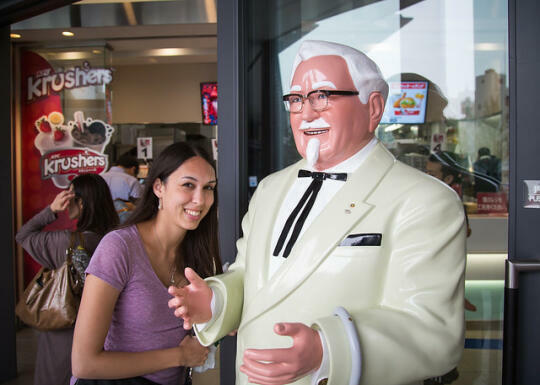 We’d heard that it’s better than KFC in the US, so of course we had to sacrifice some precious stomach space in the name of research. We did this for you, dear readers. 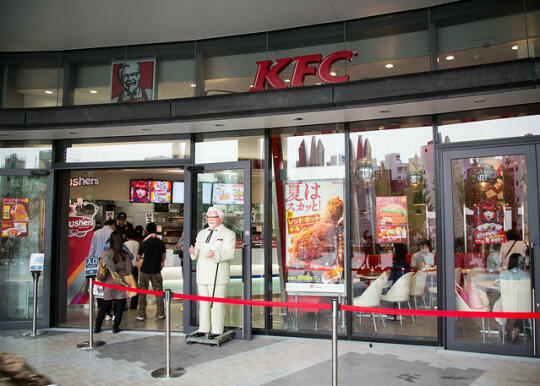 Apparently, in Japan, it is extremely common for families to eat KFC for their Christmas dinners. 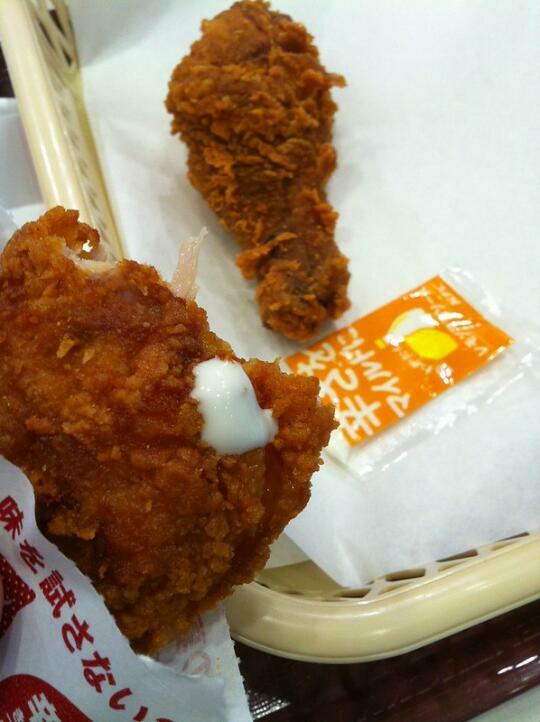 And, well, after eating Japan’s KFC, I can see why. 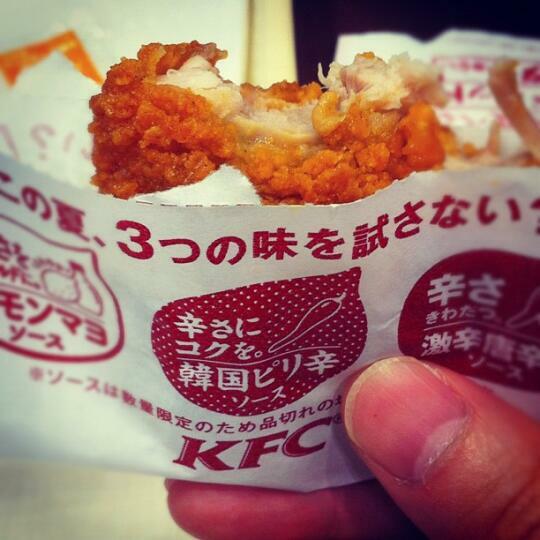 Those “11 herbs and spices and finger-lickin’ flavor” they go on about here in the US is a load of bull. To heck with that. 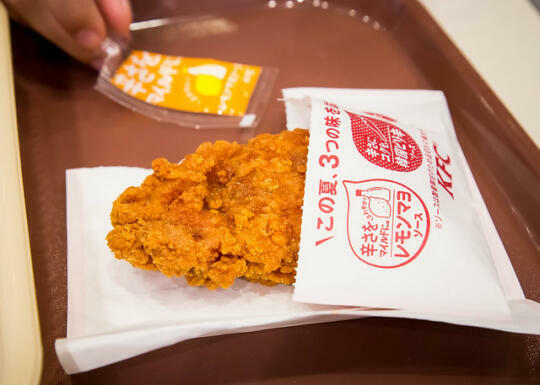 I want what KFC makes in Japan! 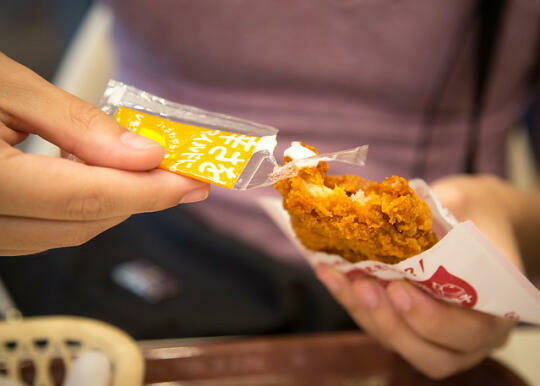 We got a drumstick, and a spicy chicken strip with honey lemon sauce. Both were much more flavorful than anything we get here in the US. And that honey lemon sauce! Seriously. 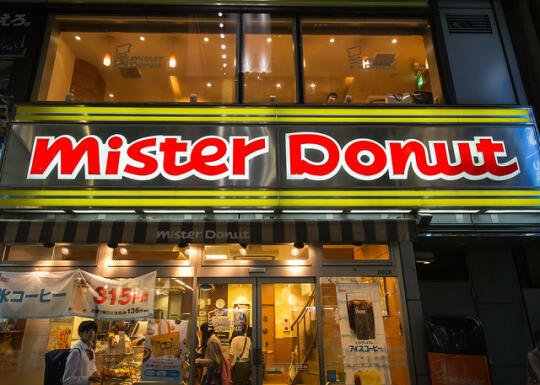 Why can’t we have this deliciousness here? You’d think after all we’d eaten so far, we’d be done, right? Like I said, pigging out. 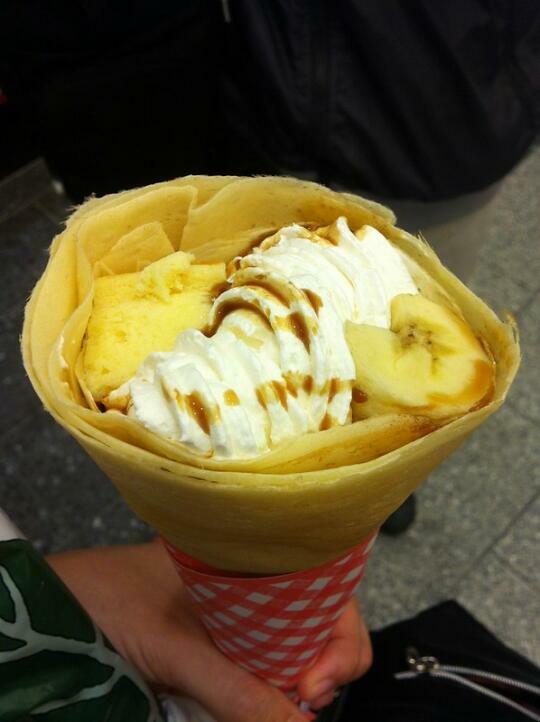 Next we got a crepe with banana slices, cheesecake pieces, chocolate sauce, and whipped cream. Okay, now we’re done eating. 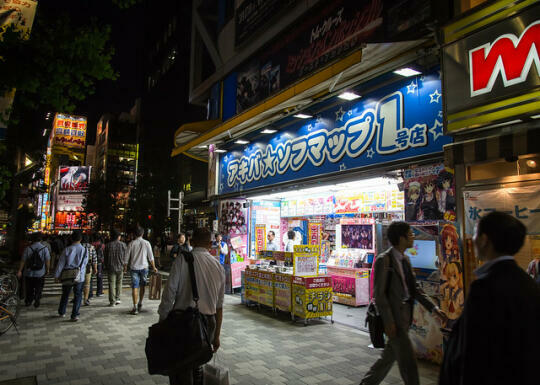 After a nap back at the hotel, we headed out to Akihabara because Son wanted to look for something. So obviously, I needed doughnuts to soothe my nerves. We got a glazed pon de ring donut (the one that looks like a string of fat beads) and a whipped cream-filled donut. For 252 yen (about $3.25) it was totally worth it. After a bit more walking around, Son decided he was hungry (if you think you’re noticing a trend here, you’re totally right). When he saw this tempura place, he insisted we try it. This was pretty much the best tempura we’ve ever had. You know how I know that? Because even now, nearly four months later, Son still cannot stop talking about it. 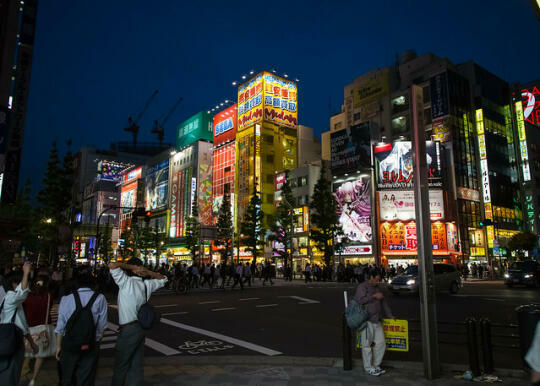 And then, because Son was still hungry (and had developed a fondness for the bento boxes from Ueno station the previous night), we headed to Ueno station. For a bento box, of course. So much food. I feel fat just from reading this post. Bento boxes!!! love them- little boxes of pure yummy joy! Perrin – I totally agree! 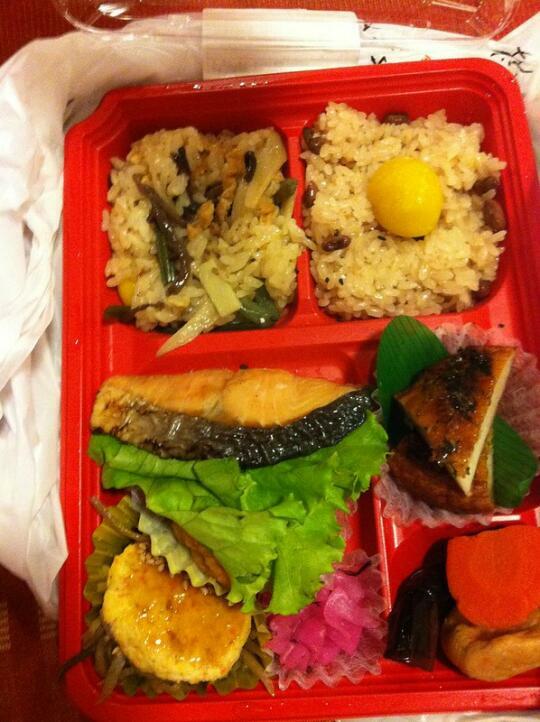 And I love how the bento boxes in Japan come with SO many different kinds of interesting foods in them. I don’t doubt you ate more in Osaka. 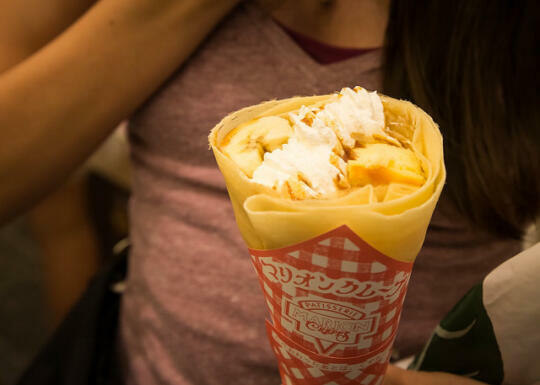 The street food scene there seems pretty epic. Some pretty amazing dishes there.